There has been intensive work on the parameterized complexity of the typically NP-hard task to edit undirected graphs into graphs fulfilling certain given vertex degree constraints. In this work, we lift the investigations to the case of directed graphs; herein, we focus on arc insertions. To this end, we develop a general two-stage framework which consists of efficiently solving a problem-specific number problem and transferring its solution to a solution for the graph problem by applying flow computations. In this way, we obtain fixed-parameter tractability and polynomial kernelizability results, with the central parameter being the maximum vertex in- or outdegree of the output digraph. Although there are certain similarities with the much better studied undirected case, the flow computation used in the directed case seems not to work for the undirected case while f-factor computations as used in the undirected case seem not to work for the directed case. 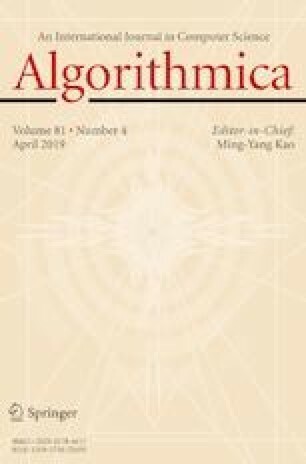 A short version of this article appeared in the Proceedings of the 11th International Symposium on Parameterized and Exact Computation (IPEC ’16), pp. 10:1–10:14. Schloss Dagstuhl–Leibniz-Zentrum für Informatik, 2017.